Sen. John McCain released a new tough-talking television ad that blames illegal immigrants for ?home invasions [and] murders? and calls for the completion of a fence along the U.S.-Mexico border, reversing years of on-the-record comments the Republican has made opposing such a barrier. Sen. John McCain has released a tough-talking television ad that blames illegal immigrants for "home invasions [and] murders" and calls for the completion of the "danged fence" along the U.S.-Mexico border, reversing years of criticizing such a barrier. Facing the most difficult primary challenge he has seen in years, the ad is the most recent in a series of measures McCain, R-Ariz., has taken which play to the far right of his party, including endorsing a controversial new law that allows police to stop people they suspect are illegal immigrants and demand identification. The senator's office said the campaign ad did not indicate a change in his position on border security. Walking along the incomplete fence with Pinal County Sheriff Paul Babeu, McCain says: "drug and human smuggling, home invasions, murder." To, which Babeu responds, "We're outmanned. Of all the illegals in America, more than half come through Arizona." Babeu tells McCain that his proposal for curbing illegal immigration is a perfect plan: "You bring troops, state, county and local law enforcement together." "And," adds McCain, "complete the danged fence." "It'll work this time. Senator, You're one of us," Babeu replies. Since 2008, more than 500 miles of patchy fence have been built along the nearly 2,000-mile border with Mexico, mostly in Texas and Arizona, but its efficacy is debatable. McCain's call to complete the "danged fence" is similar in tone to a comment he made in 2007, but rather different in substance. In a 2007 Vanity Fair interview, McCain said, "I think the fence is least effective. But I'll build the g..damned fence if they want it." A year later in September 2008, on the eve of the presidential election, McCain told the Spanish-language station Univision that his plan did not include "walls and fences." "What my plan was, and what our proposal was, that we secure our borders, and we can secure it, not necessarily with walls and fences. Although that is important in populated areas, in the deserts of Arizona vehicle barriers, cameras, and sensors, all of those things, can be used," he said. In 2005, McCain and Sen. Ted Kennedy, D-Mass, proposed a bipartisan plan that would increase border security, but also grant amnesty to illegal workers already in the country. The bill ultimately failed in the Senate. The near 180 degree flip in his position led conservative columnist Kathleen Parker to deadpan to ABC News.com: "Let's just say that my cringe reflex is exhausted." McCain's spokeswoman Brooke Buchanan denied that the ad was a change in his position. "Sen. McCain has consistently called for and introduced legislation mandating fencing, both physical and virtual, as key elements in the comprehensive approach to secure our southern border as far back as 2007 and as recently in the 10-point border security plan Senators McCain and Kyl introduced last month. "I'm appalled by the blatant disregard for Sen. McCain's longstanding record on this important issue. Next time, perhaps ABC News can do their journalistic due diligence before reporting such obvious falsehoods," Buchanan said. In March, just after the Arizona state legislature passed its controversial immigration bill, a spokesperson for McCain said the senator would not take a position on it because "It's a state issue." McCain's primary contender, former Congressman J.D. Hayworth, has drawn support from Tea Party activists, backed the bill and chided McCain for not supporting it. Soon after, McCain came out in support of the recently enacted Arizona immigration legislation. McCain always said border security was a precondition to any plan that would give citizenship to illegal immigrants and he has not changed his position on naturalization, said Dan Schnur, a former advisor to McCain in his 2000 presidential campaign and now a professor at UC Berkeley. Schnur said McCain's change in policy had to do with political pressure he was receiving from conservative elements in his party, but also had a lot to do with the reality of the situation in Arizona, where illegal immigration has spiked in recent years. "Some of it has to do with type of primary that he's facing. But there is also been a fairly substantial change in the real world situation in Arizona," said Scnur. "There is no question that political pressures have had some impact, but just as great an impact has been a result of the on-the-ground situation." Some conservative analysts do not see McCain's change in policy as a reversal, or a kowtow to the Tea Party but in keeping with his long-standing strategy to be a maverick. "It ain't front page news that Sen. McCain shoots from the hip and is impulsive. Remember he picked Sarah Palin for his running mate," said former George W. Bush advisor and Republican strategist Matthew Dowd. "Also, keep in mind this doesn't represent the influence of the Tea Party since every poll in Arizona and nationally shows Americans are longing for secure borders and support what Arizona did because they don't trust the federal government," Dowd said. 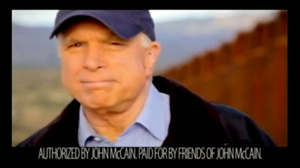 New Ad: McCain's 'Danged Fence' Flip-Flop?